Description: This stamp by All Night Media is titled: Proud Tigger #199-F02. So cute for your handmade cards. Description: This is a tub filled with 9 different mini stamps and 1 mini ink pad in Blue. Called Pooh Party, you get stamps of Streamers, Confetti, Piglet with a Party Hat on, a Single Party Hat, A Present, A Cake, Tigger's face with a party hat on, Pooh with a Party Hat on and Eeyore with a Party Hat on. Made by All Night Media and so cute for making Birthday Cards and Invitations!! All stamps and ink pad come in a plastic tub with a lid for easy storing!! Description: This is Bouncing Tigger from All Night Media and the Disney collection. Tigger balancing on his tail will make fun cards for everyone!! Description: This is Skipping Pooh from All Night Media and the Disney collection. Description: This is Thoughtful Piglet from All Night Media and the Disney collection. Cute when used with any Pooh or Tigger stamp!! Description: This is a wonderful stamp made by All Night Media and part of the Disney Collection. I'm Eeyore is a wonderful image of Eeyore alone looking back. Description: This Disney stamp is made by All Night Media. Perfect for the Pooh lover!! Pooh eating Honey!! 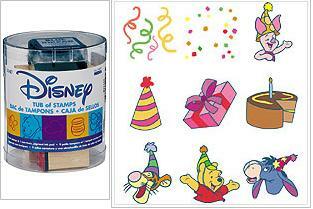 Description: This Disney stamp is made by All Night Media. Perfect for the Pooh & Piglet lover!! These two are great pals. Description: Fun and economical kid-friendly Stamp Strips from All Night Media include 3 foam-mounted stamps and a washable, child-safe nontoxic inkpad. This set design includes Winnie the Pooh, Piglet and Tigger. Comes with a Purple inkpad. Description: Fun and economical kid-friendly Stamp Strips from All Night Media include 3 foam-mounted stamps and a washable, child-safe nontoxic inkpad. This set design includes Classic Winnie the Pooh, Classic Tiger and Classic Piglet with balloon. Comes with a Brown inkpad. Description: Fun and economical kid-friendly Stamp Strips from All Night Media include 3 foam-mounted stamps and a washable, child-safe nontoxic inkpad. This set design includes Winnie the Pooh, Piglet and Tigger all portrait style with framed faces. Comes with a Purple inkpad. Description: Fun and economical kid-friendly Stamp Strips from All Night Media include 3 foam-mounted stamps and a washable, child-safe nontoxic inkpad. This set design includes Winnie the Pooh sitting and hugging Piglet, Pooh standing and hugging Tigger and Pooh walking and holding hands with Piglet. Comes with a Purple inkpad.